Mice are a very common pest for many residents and are often treated with lengthy trapping and baiting plans by most pest control companies. 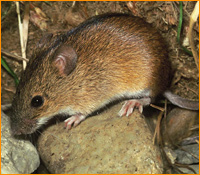 Baiting services are meant to eliminate or control the population of mice that currently reside in a specific dwelling but do not provide for a long term solution. If you eliminate the mice that have become nuisance but do not treat areas of their entry then you have only provided yourself with temporary mice control. *In some cases baiting services might be the most feasible option due to the condition of a home. Mouse proofing can be tedious and detail oriented work in turn making baiting services more cost effective for some customers. Is it possible to mouse proof your home or commercial building? Absolutely, in fact most of our services provided for nuisance and pest wildlife are targeted towards exclusionary and preventative solutions. Compared to monthly contracts of control by the use of poisons and chemicals we aim for quality prevention by finding active and non-active areas of entry in order to prevent further mouse infestations by sealing these areas. Precision Wildlife has performed hundreds of bat removal and exclusion projects across Massachusetts, seeing that bats can fit through 1/4" openings, we have adapted many of the same exclusionary methods used in bat prevention to our mouse proofing services. One common misconception about mice is that they always enter at the base of your home and before I started to investigate mouse removal and prevention services I believed this to be the case as well. Mice are actually great climbers and can enter through areas of a homes roof or gutter lines. Being on so many roofs for bat removal services I would occasionally see mice droppings in gutters and on chimney ledges near openings that led directly into a homes attic. This reinforces the fact that mice will enter through areas other than a homes foundation as well as the fact that a home can be mouse proofed if all proper areas are sealed. Common areas of entry with out a doubt are still mainly focused at ground level near garage doors, basement doors, and foundation moldings. Our mouse proofing services come with a written 1 year warranty with an optional extended service plan at the end of the warranty. Our extended service plan is meant to detect any changes in home that might allow mice to re enter therefore maintaining a rodent free environment for you and your family. Precision Wildlife offers services for the elimination and prevention of rats to Greater Boston, Eastern Massachusetts, New Hampshire and Rhode Island. Our rat removal services include complete elimination of any and all current rat activity in a particular home or commercial building as well as the prevention of further rat activity. What sets our rat removal services apart from most pest control companies is that we often can eliminate a rat infestation with no chemicals or poisons. Our complete rat removal services will carry a 1 or 2 year warranty depending on conditions and the integrity of a building. Our first step is a customer consultation and a complete inspection of the building in question. After we fully understand the history behind your rat infestation and the means of which they can be entering your building we can then design a custom elimination and prevention plan to rid of your rat problem. You will be presented with a complete proposal outlining our services in full including warranty information and trap monitoring services. note: baiting services are sometimes a last resort depending structural integrity and infestation size. Baiting for rats is also used in outdoor environments to control rat activity.